Sir Richard Branson introduces LauncherOne to the world. Have a few hundred bitcoins lying around? Now you can use them to buy a ticket to space. 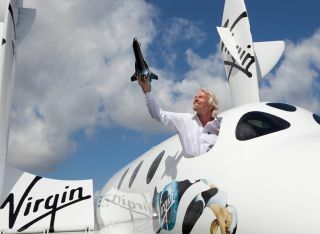 British billionaire Sir Richard Branson said his company Virgin Galactic is now accepting the digital-only currency for its commercial spaceflights aboard SpaceShipTwo. On Friday (Nov. 22), Virgin accepted its first bitcoin payment from a flight attendant in Hawaii, Branson announced in a blog post, saying he expects "many more to follow in her footsteps." "Virgin Galactic is a company looking into the future, so is Bitcoin. So it makes sense we would offer Bitcoin as a way to pay for your journey to space," Branson wrote. "A lot of the people who have joined Bitcoin are tech-minded people, as are many of our current future astronauts." According to current exchange rates, 1 bitcoin is worth about $800 USD. The value of the digital, decentralized currency is up 6,000 percent since the beginning of this year and jumped from $200 at the beginning of this month to over $900 at one point, The New York Times reported. But the worth of bitcoins has fluctuated greatly since they were created in 2009. A seat on one of the six-passenger private flights costs $250,000 and more than 600 space tourists already have signed up for a ride, including Lady Gaga, Justin Bieber, Leonardo DiCaprio and Ashton Kutcher. "I think the fact that there's going to be a limited number of bitcoins out there and it will ultimately be capped — unlike normal currencies where governments can print more currencies — gives it a sense of security," Branson told CNBC, referring to the 21 million bitcoin cap. "Obviously there are risks involved in new ventures like this," Branson added, citing the spikes and dips in the value of bitcoins. "But I think one day it will settle at a price that, I personally believe, is higher than the price today." Virgin Galactic plans to operate flights out of Spaceport America in New Mexico by 2015. Company officials have said SpaceShipTwo passengers will have the chance to experience weightlessness and glimpse a rare view of Earth against the black backdrop of space.